Ballpoint smooth. 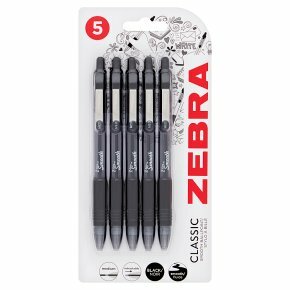 Pack of 5 black ink, low viscosity smooth ink, 1.0mm points size, retractable & comfort grip.The Z-Grip Smooth 5 pack black is a classic smooth ballpoint with a 1.0mm point size and comfort grip, the super smooth low viscosity ink provides a unique sleek writing experience. Designed for everyday use.